I noticed today that Richard G1JTD had a GPS-equipped VX-8R with him on his activation of several Wainwright summits in the Fairfield round. I spoke to Richard on his VX-8R a fortnight or so ago when I was out with my VX-8GR and he mentioned that he might get the GPS option so as to do some APRS. It's good to see more APRS activity from the Lakeland fells. 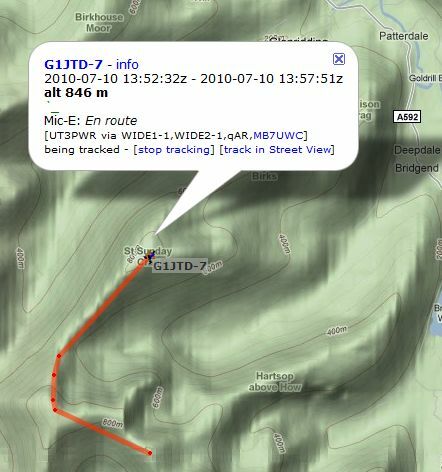 You can see Richard's track captured from aprs.fi. As you can see, his position reports were only received when he was on the summits and a few other points on the highest parts of the ridge. This is inevitable given that the only digipeaters and iGates are situated around the edge of the mountains located at the homes of amateurs and not at any great height. From my experience it's quite common to lose cellular data coverage once you get off the beaten track so smartphone based APRS isn't really much better in this situation. Running the GPS drastically shortens the phone's battery life so you are also likely to end up with a dead phone just when you might need it. I think RF based tracking is the best solution for taking APRS into the wilds. It's a pity that the power requirement and antenna size for HF operation would make it impractical to use HF for portable APRS operation. I suppose the proper fix would be putting up a digipeater on the top of one of those hills.